This state of the art community childcare facility opened to the public in September 2011. We have an excellent staff team all fully qualified in Childcare and dedicated to providing a home from home experience of learning & nurturing for every child in our care. We run 4 daily Preschool sessions under the government ECCE scheme, two morning sessions & two afternoon sessions to meet the needs of all parents and children. Our toddler room is full of fun & opportunities to grow and learn with a selective range of educational toys and games including fitness in the toddler gym! Babies from 12 months are welcome in our Wobbler Room where they are cared for with great kindness & encouraged to play & learn through interaction with staff & our excellent range of age appropriate toys. School age children are catered for in our After-School Project where we provide homework support together with a programme of activities including art, crafts, sports & computer training. We offer an excellent Summer Camp for children of all ages which combines a wide range of activities to keep your little ones happy, healthy & active during the school holidays including mid-term & Easter breaks. All of our food is sourced locally & daily menus are carefully planned to be as nutritious, tasty & healthy for all the children in our care. Our cook is a qualified Childcare Worker with extensive kitchen experience having worked previously as a qualified chef. All the staff at Suaimhneas Community Childcare operates to the highest standards observing our policies & procedures at all times to ensure the safety & wellbeing of all children in our care. We offer affordable childcare to all families including the Free Preschool Year & other government funded schemes. Please see below link to download our fees policy for more details on our prices. Early Childhood Care and Education E.C.C.E. This scheme provides one year “free” Preschool education to every child between the ages of 3yrs 2mths and 4 yrs 6 months on the first of September. It is important to understand that the free elements are limited and only relate to a certain number of hours each day. The ECCE scheme provides parents with one of two options Option A; fully subsidised sessional care or Option B; partly subsidised full day care. Parents who avail of the scheme in playschool (Option A) will be entitled to a free pre-school provision of 5 weekly sessions of 3 hours per day for 38 weeks per year. Parents who avail of the scheme within a full or part-time childcare service, will be entitled to 38 weeks of free pre-school provision amounting to a subsidy of €62.50 off their full childcare fees. Parents are reminded that places in the scheme are limited and subject to availability. Community Childcare Subvention Scheme C.C.S. 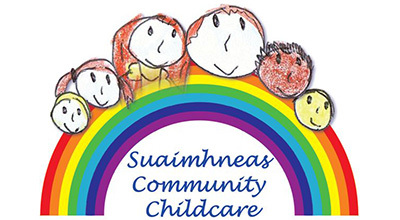 Suaimhneas Community Childcare receives funding from the government for parents that are in receipt of social welfare payments. The Community Childcare Subvention Scheme enables us to offer childcare at a reduced cost to families in receipt of social welfare. To qualify for this scheme you will be obliged to supply PPS numbers and to provide documentary evidence of the payment you receive. This information will be required every quarter. Subvention for recipients of Jobseekers Benefit/Assistance will be capped at 2½ days per week. Note : Failure to provide the required information could result in your subvention payment being withdrawn. If your circumstances change you must notify the crèche immediately i.e. if you are no longer in receipt of an entitlement. Immediate action will be taken by Suaimhneas Community Childcare if any persons are found to falsify records. The objective of the CETS programme is to support parents on certain eligible FÁS and VEC courses by providing subsidised childcare places. There are approximately 2,800 places available under the programme nationally. These are divided between FÁS and VEC courses, with full-time, part-time and afterschool places available. Feel free to drop in to us at any time, or contact the creche Childcare Manager directly on 057 86 86158. Alternatively you can fill in the contact form for more information. *Please note Portlaoise FRC is not responsible for content of external sites.